Today’s post is a special deep fried East Indian Bread known as “Fugia”which is prepared at weddings & festive occasions. 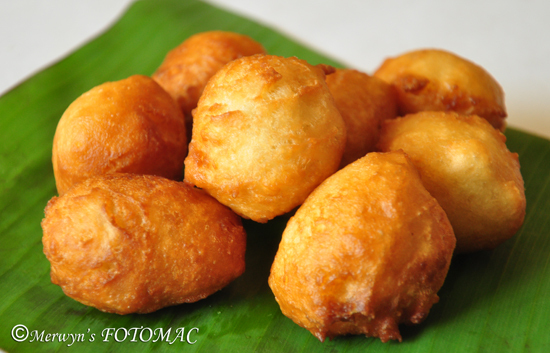 Fugia is a slightly sweet, fermented deep fried bread. They are soft & spongy round balls. Children will definitely love the taste.They are very delicious & are a perfect accompaniment to curries especially with vindaloo, sorpotel & baffat. They taste good if eaten plain as well. I had this recipe when I was new to cooking. I had joined a library & happened to come across this recipe for Fugia in a magazine & noted it down. I did not know that it was called Fugia… it was named Pom Pom! In Pune, I have not yet come across anyone selling Fugia, so I started making my own at home whenever my family feels like eating them. The technique used to make Fugia is a little difficult & needs good practice. I used a spoon to lift the batter & lower it in the wok/kadhai containing hot oil. Well, my fugias do not look very professional but they do turn out delicious & this makes me very happy . In fact, I feel elated & delighted when they turn out great! In a sufficiently large bowl, mix together maida, sugar & salt. Dilute the yeast in some water. Make a well in the centre of the dry ingredients; pour in beaten eggs, yeast solution & combine well. Add enough water to make a thick & light batter which is soft & pliable. The flour dough should be such that you should be able to form balls. Keep the batter overnight to rise well. On the next day before frying, mix it up once & keep aside to rise again for about 30 mins. Do not knead again once it has risen. Pour sufficient oil in a wok/ kadhai & heat it till hot. Wet your palms & fingers & form balls by grasping the dough with the left hand & squeezing it through the thumb & the fore finger. Dip the fingers of your right hand in water & lift each dough ball & drop them carefully in the hot oil. Deep fry on medium heat in batches till all the dough is used up. Make sure you do not over crowd the wok/kadhai. The dough balls should be uniformly light golden. 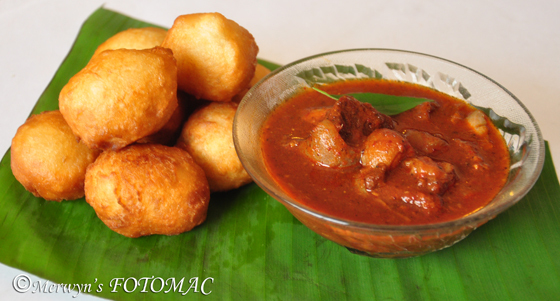 Scoop out the fried dough balls with a slotted spoon & drain off excess oil completely. Transfer to a bowl lined with absorbent tissue paper. Serve hot with vindaloo, sorpotel, baffat or enjoy plain. This bread I haven't seen or tried. It looks really good! The fugias look fantastic Hilda! We enjoy these too and I've been looking for a recipe for the longest time every. Thanks for sharing! Wow new to me,looks fantastic..thanks for sharing.